WHERE NEON GOES TO DIE, is the first documentary film to chronicle the sixty year Yiddish cultural legacy on Miami Beach. The film is produced and directed by filmmaker David Weintraub, capturing this vibrant "shtetl by the bay" with love and attention to detail. You won't find South Florida's Yiddishland on a map. No history of Miami Beach, official or otherwise includes this cultural epoch. 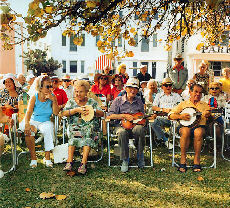 Yet at its height, it included tens of thousands of local residents and over 100,000 snowbirds. For decades, Miami Beach hosted six Yiddish theaters, eight radio stations broadcasting Yiddish programming, fifteen chapters of the Workmen's Circle (a national Yiddish cultural institution) proliferated on the beach and Yiddish choral and musical groups performed on Ocean Drive all year. Then one day it disappeared in a burst of disco lights as the Art Deco revolution and the Miami Vice-ification of South Beach resulted in mass evictions of the city's elderly and working class, many of whom were active participants in the "shtetl by the bay." Miami has always been touted as a symbol of America's diversity given the mélange of people from across the globe that co-exist here. Yet, what few realize is that entire cultural communities existed for many years where thousands relished in their history, language and culture. Overtown was a leading culturally rich place that was decimated when I-95 plowed through it in the 1960's tearing out its heart and soul. History repeated itself in the late 1970's and early 1980's when tens of thousands of working class Jews, many of them Holocaust survivors, were "relocated" so that t-shirt shops, fancy hotels and nightclubs could retake the beach. At its peak, one could swim with the sunrise swimmers off the pier in the morning, shmooze with ones landsmen (fellows from the old country) at one of nearly a dozen cafeterias for breakfast, join hundreds of people at Lummus Park for Friendship Circle performances of Yiddish music in the afternoon, participate in lectures on culture and politics with organizations like Workmen's Circle, YIVO, the Miami Jewish Cultural Center or one of dozens of vinkls (literary circles), and then dance the night away at the Miami Beach Auditorium. 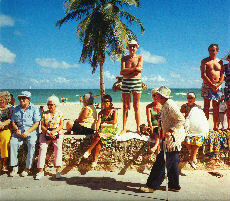 Weintraub uses rare footage, images and interviews with living members of the Miami Yiddish stage and screen to reclaim Miami's "shtetl by the bay" helping viewers understand the power and vibrancy that once existed when residents of Miami Beach lived a communal life suffused with ethnic culture. For more information about the film and the Center for Yiddish Culture, get the latest screening schedule or to purchase the film log on to: www.yiddishculture.org.